At Lakeside, we’re constantly searching far and wide to bring you some of the most unique, useful, giftable products at the most affordable prices. We’re proud to say that many of our top items are exclusive to The Lakeside Collection, meaning you can’t find them anywhere else. Check out some of the new and trending items from our Exclusive Collection below, and be prepared for family and friends to ask you where you found them! 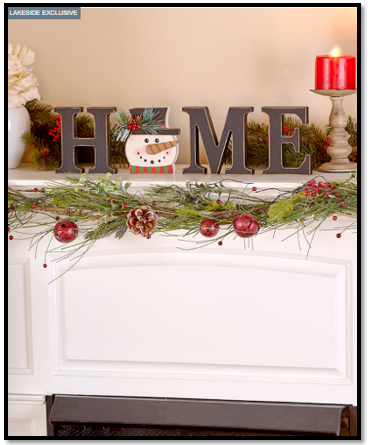 These decorative wooden letters are perfect for your holiday mantel, shelf or dining room table. Display it all year long by switching out the “O” with holiday icons for fall, winter, spring and summer! – Gets you ready for all major holidays. – Classic look fits so many decor styles. – Heartwarming sentiment for any flat surface. 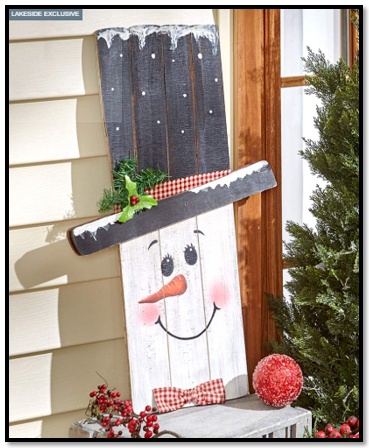 Welcome guests to your home with this fun greeter – just prop it up against the wall of your front porch or in your entryway. It’s a scarecrow on one side and a snowman on the other. Sure to bring a smile to the face of everyone who sees it! – Porch decor for fall and winter. – Switch seasons with a simple flip. – Put it to use year after year. 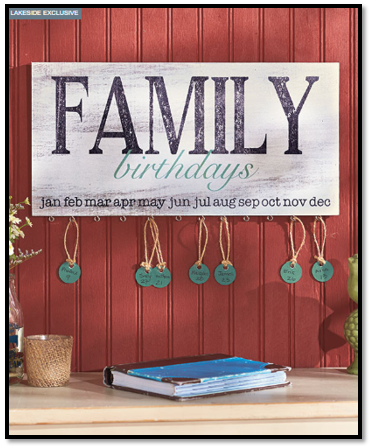 Let them know how special they are to you with this unique plaque hanging on your wall. You’ll never again forget a family member’s birthday. It comes with 24 tags to personalize with a name and birth date. 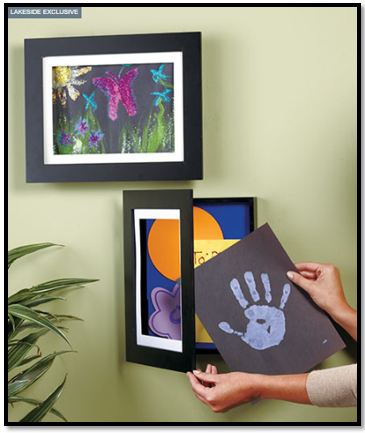 If you really want to go all out, you and the kids can add a photo or personalize with a quick arts and crafts session. 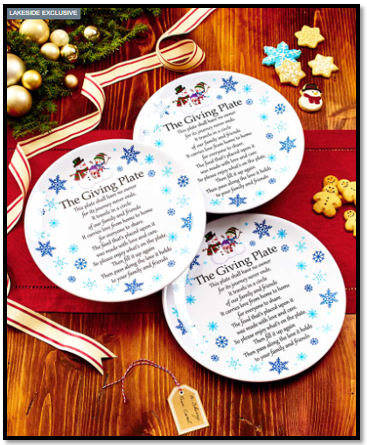 The giving plate is the ultimate example of “paying it forward.” Fill it with your homemade holiday cookies or other holiday food gifts, then give it to a friend. After enjoying your goodies, that person refills it with their own homemade treats and passes it to someone else. The journey of the giving plate is never ending! If you like to mark the changing seasons with a change to your decor, this welcome mat is for you. With a rubber frame and switchable inserts, it eliminates the need to buy a doormat for every changing season. Welcome guests in seasonal style all year! – Bright and colorful seasonal inserts. – Easy to switch from one to the next. – Durable rubber design for the outdoors. 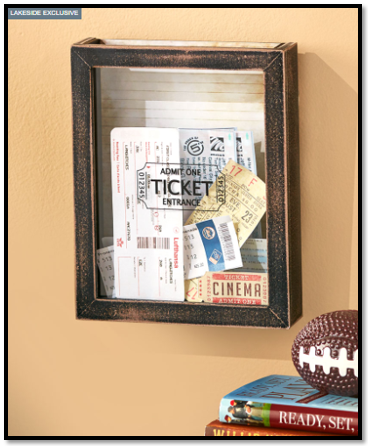 Use this wooden shadow box to store and display ticket stubs, travel brochures, boarding passes and more. Just slip your keepsakes inside. The box is designed to hang on a wall, or stand on a shelf or table. It helps you remember those special times and is sure to be a conversation starter when friends visit. – Unique way to display your keepsakes. – Easily hangs up, or stands on any tabletop. – Fun way to collect, keep track and remember. Create a keepsake that will be cherished forever! 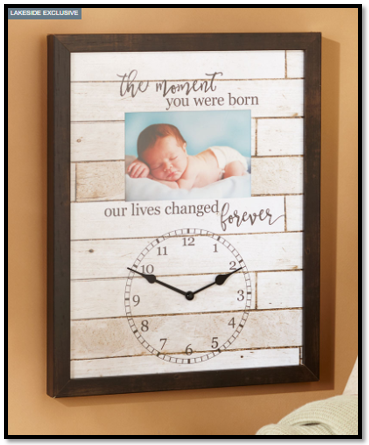 This frame celebrates the moment your family welcomed a new addition. The hands on the clock can be manually adjusted to point to the exact minute of birth. There’s also a space to display a 4” x 6” photo of your newborn baby. Perfect for display in the nursery! – Order one for every member of the family. – Switch out the photo as your child grows up. – Make it your signature gift for baby showers. While it might not turn laundry day chores into “loads of fun”, this collection will certainly brighten your mood. Update your entire laundry room in a snap with the cohesive collection, or mix and match a few of your favorites. – Lighthearted sentiments are “loads of fun”. – Calming colors perfect for stressful daily chores. 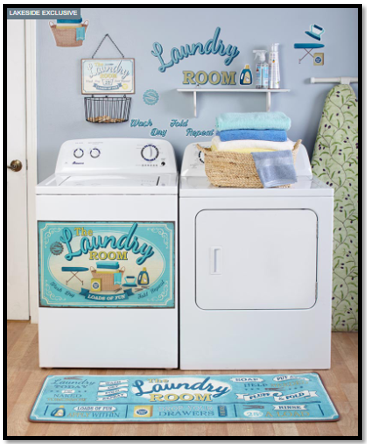 – Simple way to add personality to your laundry room. Retire your refrigerator art gallery in favor of this quick-change frame. When your child creates a new work of art, don’t throw away the old one. Store it in the frame. It has space for approximately 50 pictures, allowing you to create a visual record of your child’s artistic progress with the latest masterpiece always front and center! – Easily switches between horizontal and vertical. – Comes in common sizes for children’s artwork. – Adds a stylish border to the framed picture. One of the joys of living in a cold climate is spicing up your winter wardrobe with cute accessories. Fashioned in neutral colors, it goes with everything in your closet. 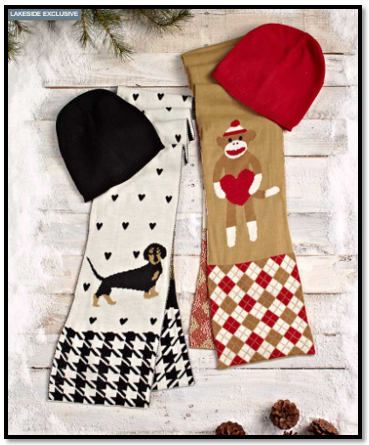 The long oblong scarf features images of your favorite animal, and the beanie-style hat complements one of the prominent colors. – Keeps you warm and stylish all winter. – Fashionable, matching hat and scarf. If you can’t get enough of our exclusive items, keep exploring our incredible Exclusive Collection, featuring home decor, gifts, festive holiday decorations, fashion accessories and so much more! 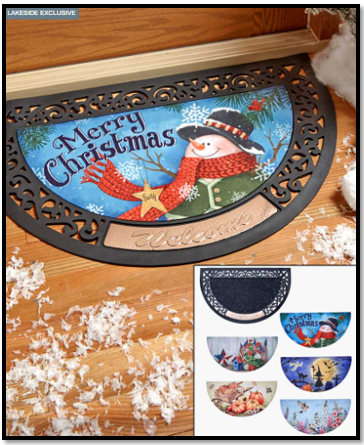 And don’t forget to take a look at our new Christmas Catalog (Christmas 2018) to check out some of the newest items available now at Lakeside. Hi Anna- We have requested a catalog for you. 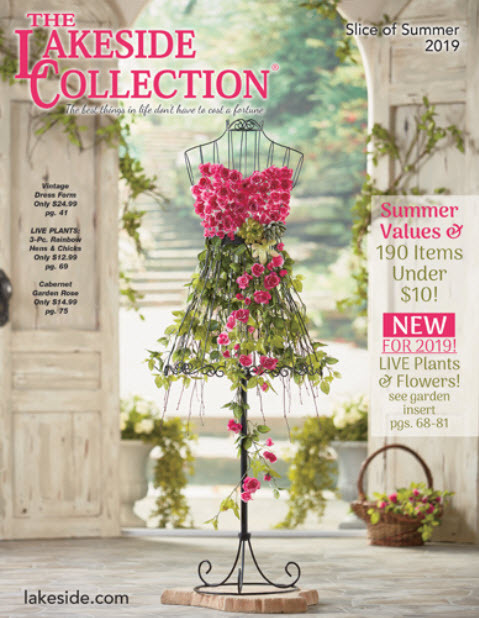 Please allow 1-2 weeks to receive your catalog in the mail. Happy shopping! I’ve moved.How can I get the catalog at my new address? Hi Sandra – For security purposes we ask that you contact one of our Customer Service Agents at 847-444-3150. They will be more than happy to assist you with updating your address! I placed and order for 2 sets of the Giving Plates via catalog, have not yet received them. Hi Marilyn – We have sent you an email requesting more information to better assist you. I would like a catalog mailed to me please. Hi Brenda – We have modified your comment to remove your address due to security concerns. Please know we have processed a catalog request for you! You can expect to receive our new Christmas catalog in 1-2 weeks from now.